An ordinary family man, geologist, and Mormon, Soren Johansson has always believed he'll be reunited with his loved ones in an eternal hereafter. Then, he dies. Soren wakes to find himself cast by a God he has never heard of into a Hell whose dimensions he can barely grasp: a vast library he can only escape from by finding the book that contains the story of his life. 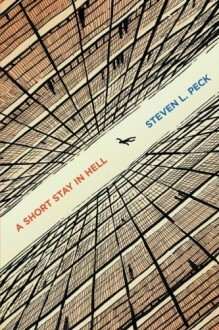 In this haunting existential novella, author, philosopher, and ecologist Steven L. Peck explores a subversive vision of eternity, taking the reader on a journey through the afterlife of a world where everything everyone believed in turns out to be wrong. Title is extreeeeeeeeeeeeeeemely ironic.Short read and very thought provoking.Clever alternate take on the concept of hell. Simply fantastic. I have no words.